Tuscan Themed Outdoor Kitchen w/ Earth Stone Pizza Oven and Fire Pit w/ Water Feature » Outdoor Fire Pit Water Feature built into the bar top with LED color changing lights. This outdoor bar really came together. There are LED lights with in the copper trough and under the bar tops. A piece of tempered glass bridges the gap between the two granite bar tops. 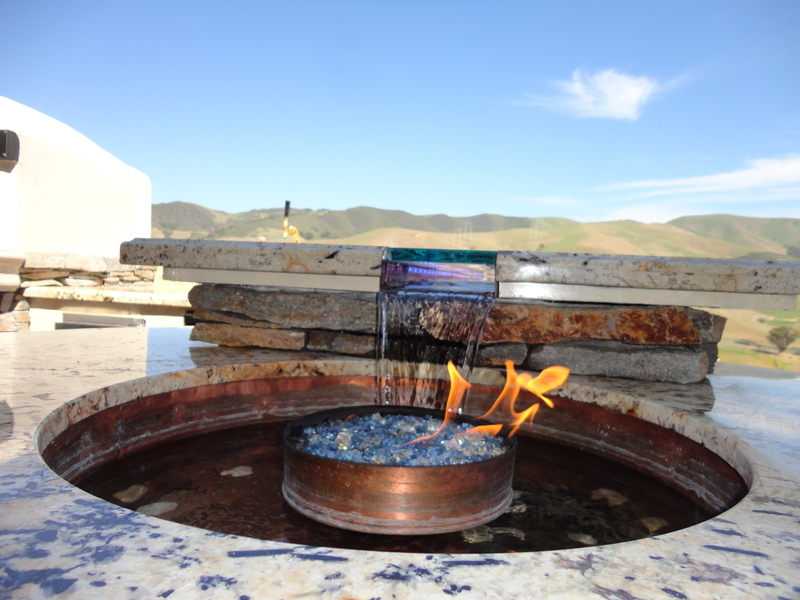 The water trough, copper water fire pan was custom made to accommodate the bar. The entire concept was designed and built by us here at Leasure Concepts. This entry was posted on Thursday, May 30th, 2013 at 6:01 pm. It is filed under . You can follow any responses to this entry through the RSS 2.0 feed. You can leave a response or trackback from your own site.